The precise function of the series of English tin-glazed earthenware seated cat jugs common to the 1650s-70s is unknown but, as many are dated and initialled, they may have been given as marriage or betrothal gifts. Surviving dated examples range from 1657 to 1677 – an example from 1677 was sold by Bonhams in 2014 for £22,500. 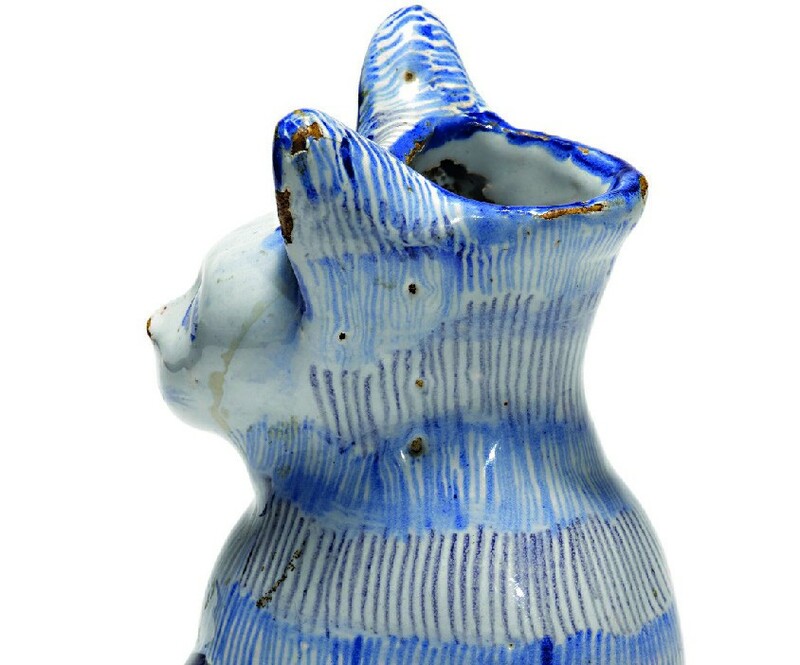 This month, an undated 6in (16cm) cat-form jug was among the strongest performers of the Anne and Frederick Vogel III collection offered at Sotheby’s New York. The 131 lots of early British ceramics owned by the Milwaukee couple were all types known in colonial America – many of them matching sherds excavated at Jamestown or Williamsburg or pieces in keystone collections. 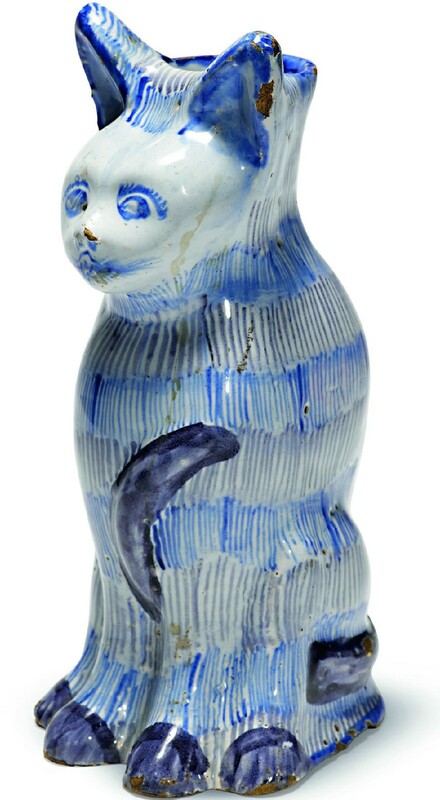 The Vogels had bought their delft cat from London dealer Jonathan Horne in 1985. Fragments of a similar jug, with its coat decorated with alternating horizontal bands of manganese and blue stripes, were excavated on the Governor’s Land in James City County, Virginia, home to the influential Drummond family in the 17th century. With only minor imperfections, it sold on January 19 at $65,000/£50,000 (plus 25% buyer’s premium) – more than double the top estimate of $30,000. The price compares favourably with others that have appeared at auction in recent years. The undated example in Syd Levethan’s Longridge collection (June 2010) took £25,000 while that dated 1659 in the sale titled Simon Sainsbury The Creation of an English Arcadia (June 2008) sold at £38,000, both at Christie’s. More on the Vogel collection in a future issue.